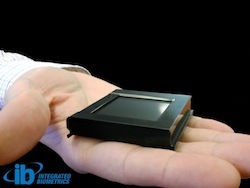 Integrated Biometrics has released Watson-Mini, the smallest and fastest non-optical mobile ID fingerprint scanner that’s achieved FBI Appendix F certification. The scanner meets or exceeds all requirements of EBTS Appendix F Mobile ID SAP 45 and PIV-071006 of the FBI IAFIS Image Quality Specifications. The Watson-Mini weighs 85 grams and measures 61 mm x 60 mm x 34 mm. It leverages Integrated Biometrics’ Light Emitting Sensor technology that uses a highly engineered charged polymer film to interact with certain properties of the skin to capture fingerprint images. It also has the capability to perform high quality imagining in dirty environments and in direct sunlight. The system does not use a membrane and doesn’t require that latent prints be wiped from the sensor surface. 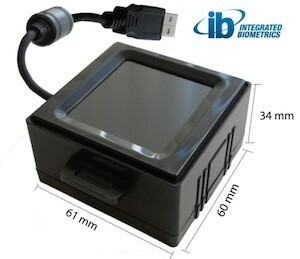 The scanner can be embedded within hardware, or it can connect externally via a USB port. 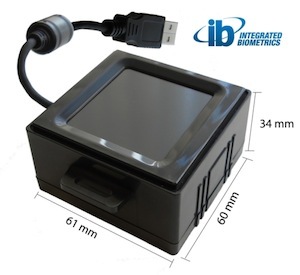 Its software is Integrated Biometrics SDK for Windows XP and later, Linus or Android 4.0 OS.